OH WHAT A BEAUTY! 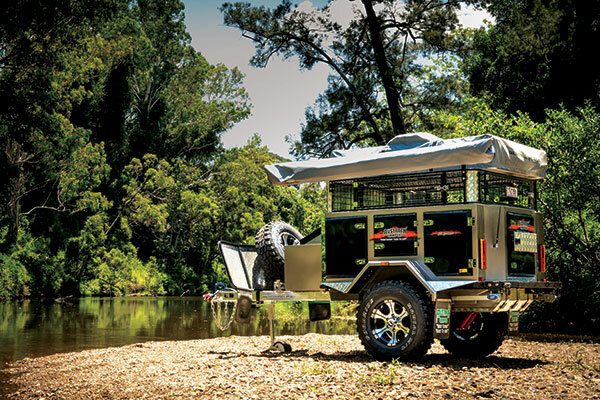 The evolving world of camper trailers has just moved forward in one giant leap with the ripper new Austrack Simpson. Let’s start by emphasising the main point – its retail price is just $15,990 – WOW! Make no mistake, the Austrack Simpson has a very attractive purchase price — this is a tough little contender that simply makes sense for a very large percentage of Australian campers. The Simpson is a compact, go-anywhere unit with an amazing amount of storage and essential facilities like power, water, storage and cooking equipment that will really appeal to those of us who are sick of heavy-weight units that take forever to assemble. We are all, no doubt, aware of the popularity of the premium compact camper. The type that makes true blue Aussie sense when off on a spot of long distance outback offroad touring. In recognition, the Austrack Simpson is built on a strong foundation with its fully welded hot dipped galvanised 100 x 50 x 4mm RHS box section drawbar and chassis. The trailer has excellent ground clearance and rough track capability from the heavy duty independent coil spring suspension with double shock absorbers that rides on 265/75 x 16” alloy mag wheels with six stud hubs, heavy duty parallel bearings and 12 inch heavy duty electric brakes. Out in front of the A-frame drawbar is a two tonne polyblock offroad coupling, mechanical handbrake, swing down Ark XO Series extra heavy duty jockey wheel, Anderson plug and a convenient handle for easy manual maneuvering. Next is a full width aluminium stone guard with replaceable mesh with the spare wheel mounted behind and easily accessible. There is a tool box in front of the main tub that opens from the top with a 9kg gas bottle mount, plus a large storage box and additional room for 2 x 20 litre jerry cans on the driver’s side. All of the tub and body shell feature a very attractive baked enamel metallic finish with polished aluminium trim. All steel components are Zincanneal steel with underbody deadener protected and galvanized chassis & drawbar. 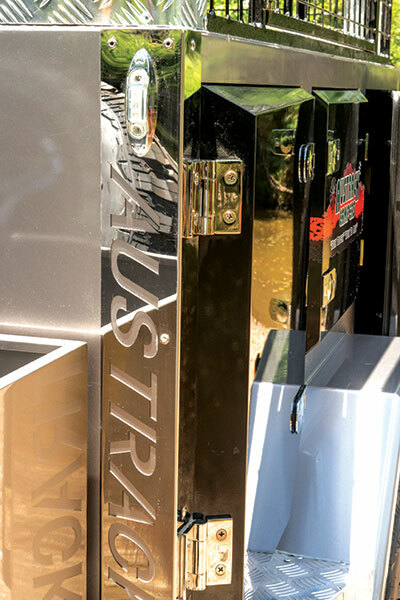 All of the compartment doors and hatches are neatly folded and finished and feature lockable compression locks, quality hinges and automotive rubber seals. The main tub is a wee little ripper! 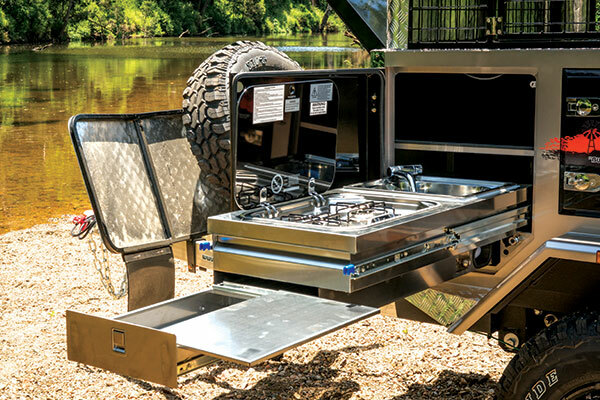 This highly versatile unit features a stainless steel slide out kitchen with water and power outlets and tonnes of valuable storage. The S/S kitchen slides out of the front kerb side where it is well sealed with more dust proof doors. It features a twin burner Smev stove and pressurized cold water sink with a handy sliding drawer out the end for all of your utensils. Austrack emphasise that all of the fittings and assembly are fully gas compliant. The kitchen is quite well protected from head wind with the opening door plus the Smev flip up lid and recessed burners. On top of the kitchen is a full width storage compartment that can accommodate wide items such as tent poles and fishing rods, and it is all carpet lined. There is plug in fittings for auxiliary 12 volt power, water and gas fittings plus electrical switches for external LED lighting. Over the top of the mud guard we find yet another big storage compartment and the trend continues in the rear with an even larger secured cavity complete with a sliding drawer and Bluetooth stereo with speakers tucked neatly out of harm’s way. As usual the kerb side of the trailer is generally the “living” side – (“you’ll always find me near the kitchen at parties”, he sings to himself!) 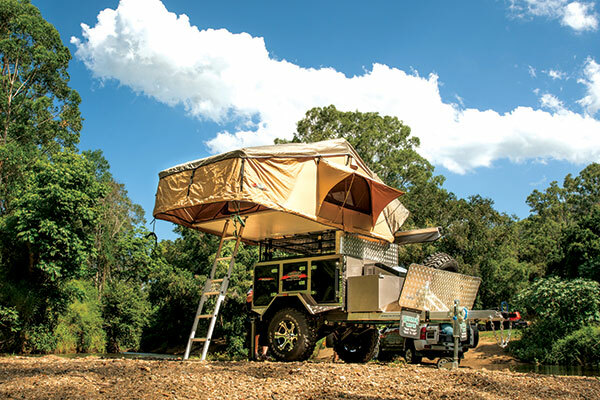 Overhead is a retractable bat wing style 270-degree fold out awning allowing a reasonable level of shady protection over the side and rear of the camper. A full set of walls can be supplied for this awning as an optional extra. There are checker plate steps either side of the wheel arch and this theme is continued around the rear of the trailer with a full width step making the roof easily accessible. There’s also a pull out drawer for an 80 litre fridge capacity tucked neatly away. Underneath and secured to the chassis is double slide style recovery hitches and also a push bike carrier or similar. 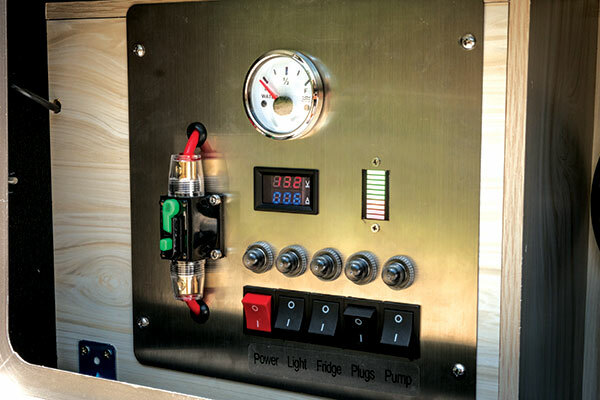 The doorways are mirrored on the driver’s side of the trailer and the rear compartment houses the electrical control panel with twin 100AMP/hr deep cycle AGM batteries plus its indicators and management system, water level gauge, double USB and resettable electrical switch gear. The storage just keeps on coming with another cabinet with sliding drawer over the wheel arch, and of course the full width cabinet with added compartment reflecting the kitchen in front. Up top are many options, however it starts off with a checker plate alloy flat top with a solid pack rack. Some may prefer to customize at this point; some may prefer swag or water craft storage, however the kit price comes complete with a premium quality Austrack “Superior” 1.8 metre wide roof top tent complete with upgraded canvas , strong poles and secured neatly in a water and dust proof PVC bag. The package even comes complete with a lower annexe for added accommodation. I have to say that this is one of the easiest roof top tents on the market, in fact the whole camper seems totally stress free. It can be set up in a jiffy by simply removing the PVC cover and opening the two piece hinged floor by simply cantilevering on the folding ladder - the whole tent simply springs to attention. There is a small vestibule area at the front ladder entry secured by a single attached bow. This need to be pegged out in the corners for security in the breeze. The added roof area supplies that extra level of protection before climbing into the sack if it’s raining. The tent itself is made from strong 260gsm canvas and has its own tropical roof for added insulation. 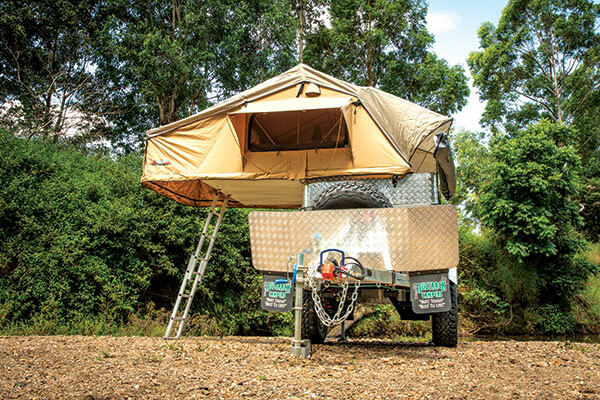 I particularly like this camper for northern sojourns as it has plenty of ventilation courtesy of opening windows with two stage awnings and midge mesh protection. The outer awnings pop open easily catching the breeze nicely on those clammy nights. It also gets you high up above green ants and larger bities, especially when camping around croc infested waterholes with the occassional feral animal like pigs, dogs etc. The Simpson can be set up in a jiffy when you arrive at your ideal campsite, or maybe just a wayside stop for a cuppa on a long journey. If you need a break from your travels simply fold out the awning if you want shade, pull out the kitchen and fridge and your portable wayside stop is set up. If you are staying the night it seriously only takes a few more minutes more to detaching from the towing vehicle, drop the heavy duty wind down stabilizer legs and set up the roof top tent ready for a snuggle. The Simpson carries of 100 litres of water in a single tank positioned at the rear of the suspension, keeping weight nicely balanced and down low, further adding to its steady footing. It’s tare weight is a very reasonable 900kg including the tent and the 1480kg ATM allows you to carry plenty of toys, equipment and supplies for extended touring. 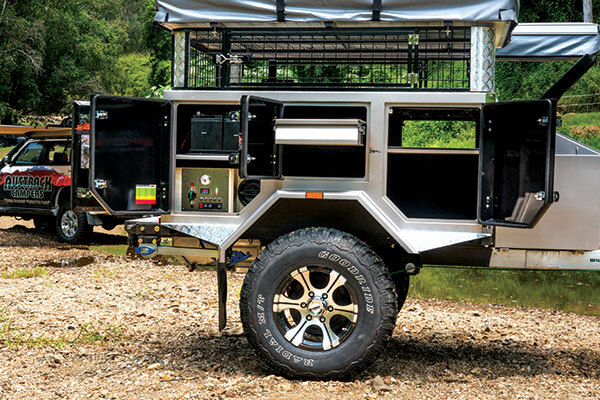 The entire unit measures in at a very compact 4100 x 1800 x 2200 mm that adds to the Simpson’s agility in tight offroad scenarios, and makes it easy to store at home. I don’t mind unashamedly admitting that I like Austrack Campers, and their friendly and accommodating team are always a pleasure. The Simpson is a very complete unit in its package form, however everyone seems to want something a little different in their perfect camper hence the crew will be pleased to work with your every desire. I personally see a huge future in front of the Austrack Simpson, and I certainly rate the package in the upper echelon of value-packed, convenient and tough little Aussie nuggets. To buy your own camper, head to www.TradeRVs.com.au and search for Camper Trailers.